As promised, here is the first big installment for Greek Food Month! I tackled Vefa’s moussaka recipe, but gave it a little twist, leaving out the lamb so that my partner could enjoy it (he’s vegetarian). It was a time consuming—but not particularly difficult—recipe, and included the added bonus of teaching me how to make a béchamel sauce. Shockingly, I had never made what the Greeks call “white sauce” – but it will be a regular casserole topping from now on! 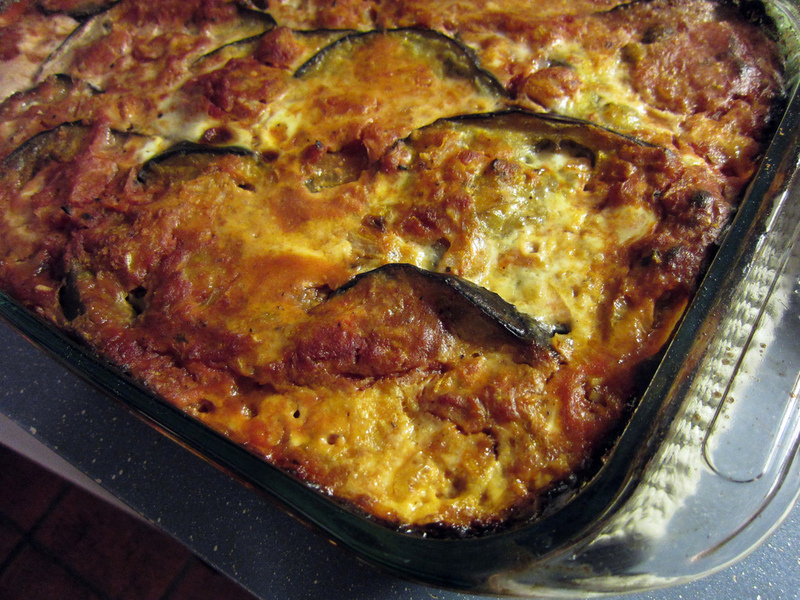 I’m not going to post the recipe here, because I don’t want to take away from Vefa’s hard work, and there are many (perhaps thousands) of moussaka recipes on the internet. It’s a pretty standard dish, not just in Greece but across southeastern Europe, Asia Minor, and the Middle East. It took three hours in total, from slicing the first eggplant to serving, but it was fun, and we now have enough left over to have moussaka for every meal for the next three days! In fact, we’ve already started planning breakfast (moussaka topped with a fried egg!). I’ll just post a photo essay memorializing my first encounter with the quintessential Greek dish. But not tonight. I’ve just finished cleaning up and uploading pictures, and it’s already midnight! So, for now, just a little taste… Καλή όρεξη! This entry was posted in Essays, Greek, Mains, Other Randomness, Vegetarian by Susan. Bookmark the permalink.